Braille font system, for Pharmaceutical Packaging, designed to Marburg Medium font standard. The PharmaBraille Braille font system complies with Pharmaceutical Braille standards. Our Braille font sets produce precise visual Braille characters for pharmaceutical packaging artwork—conforming to the Marburg Medium braille font standard for pharmaceutical packaging, as required by the Can-Am Pharmaceutical Braille Standard for USA and Canada, the ECMA Euro Braille Standard and the European Blind Union Guidelines on Braille Labelling of Medicinal Products. PharmaBraille is a Braille font system designed for medicines packaging. You already know how to work with fonts—with PharmaBraille there is no complicated Braille translation software to worry about. Our Braille fonts work with your existing design tools—including InDesign, Illustrator, QuarkXpress and Word. 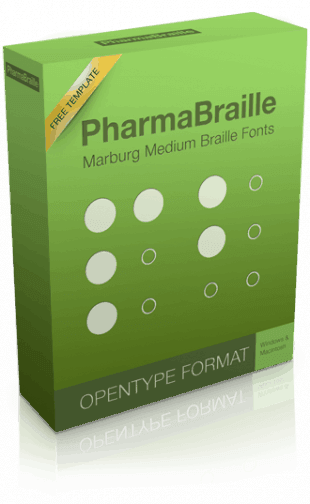 Simply install the fonts on your Mac or PC to follow the procedures for pharmaceutical braille artwork and create artwork for pharmaceutical packaging. Royal National Institute of Blind People (RNIB) and the European Blind Union (EBU), have helped us develop the European Braille Guidance area of our website to provide access to the EBU Braille code and practical guidance for implementing Pharmaceutical Braille in Europe. Braille is three dimensional tactile bumps on a medium. In order for these bumps to be represented on digital artwork the designer places black filled dots on the layout. The dots can be a simple grid of dots, but the most efficient method of creating these dots is with a braille font. Discover how our braille font and braille tools can help in the creation of braille artwork. Braille font character sets consist of letters, numbers, punctuation, symbols and special accent characters. Discover how and why these braille alphabets differ. There are many specifications for setting Braille type. However, the PharmaBraille Braille Font System complies with the Marburg Medium Braille Font Standard for Pharmaceutical Packaging, as recommended by the European Commission and the Can-Am Pharmaceutical Braille Standard for USA & Canada for use on pharmaceutical packaging and labels. There are a few simple guidelines to follow when working with PharmaBraille fonts to ensure your artwork complies with the Marburg Medium Font Standard for Pharmaceutical Packaging. Refer to How to Use PharmaBraille Fonts to get the best from our braille font system. Copyright © 2019 — SteelDesign • All rights reserved. PharmaBraille fonts are developed and licensed by SteelDesign, PO Box 8610, TROON KA10 9AY, UK.